Vivo is celebrating National Grilled Cheese Month all April long. 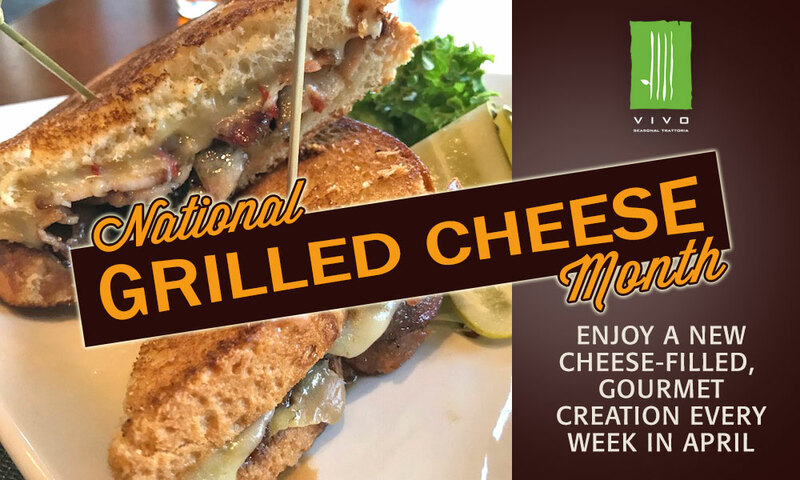 Our lunch service guests will enjoy a new and distinctive gourmet grilled cheese creation during lunch service each week in April. These beautiful, cheesy and amazing sandwiches are priced at just $9 and include a choice of house chips, fries or side of greens. Vermont grilled cheese with Cabot cheddar, gruyere, sliced apples on sourdough. Monterey jack cheese and maple cheddar with crispy pork belly, fig jam on brioche. Grilled 3-cheese with shredded mozzarella, gruyere, provolone, caramelized onion on ciabatta. Roasted tomato grilled cheese with cave-aged cheddar, brie and basil pesto on focaccia.